Capybaras are the largest known rodent species in the world, growing to more than 100 pounds. Native to parts of South America, these rodents are semi-aquatic, usually living in dense vegetation around bodies of water. Although more commonly found in zoos, capybaras are also occasionally kept as pets, although importation of these animals is difficult, with owners required to attain both state and federal permits. Most states require that shipments of capybaras be individually applied for and approved by the relevant state regulatory agency. For example, in Oregon, all exotic animals must receive an import permit from the Oregon Department of Agriculture Animal Health and Identification Division. Most states require that before the capybara be brought into the state, it be inspected by a licensed vet employed by the government, who will check if the animal is carrying any infectious diseases. The vet will also make sure that the animal is in good health and is receiving proper care. The capybara may also be required to receive vaccinations against illnesses to which it might be exposed in its new environment. Capybaras cannot be released from their cages at any time during the importation procedure. 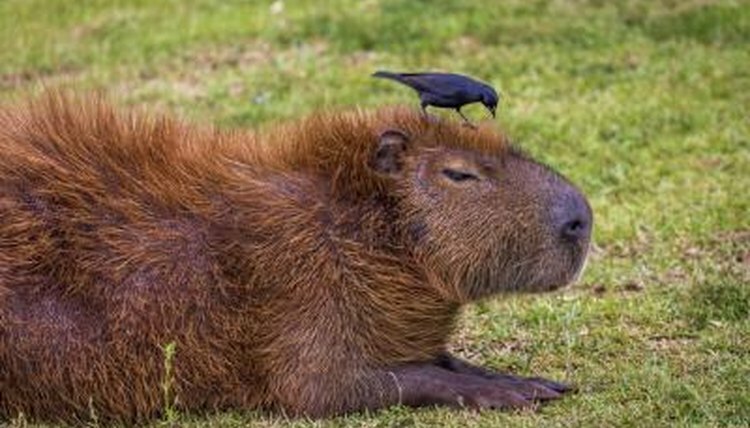 If a capybara escapes, the escape must be immediately reported to local authorities, and the importer may face a fine. In addition to the veterinary tests required on animals being imported, importers must also assure that the animals are provided with a habit sufficient to their needs. Laws vary among states, but most states require that the cages in which the animals are traveling be of sufficient size to accommodate the animals comfortably. In California, a single capybara is required to have 100 square feet of cage space, with each additional capybara requiring 50 additional feet of space and a 5 foot ceiling. A pool and gnawing logs must also be placed in the cage. Cages must have clean, infection-free and have plenty of palatable food and potable water. The capybaras must also not be chained, except when the cage is being cleaned or during emergencies. Most states require that people importing exotic animals, which in most states includes capybaras, hold a general license that ensures they are qualified to safely transport and maintain the animal, including providing it a proper habitat and food. Importers in Oregon, for example, must receive an "Exotic Animal Facility Permit." In addition to state licenses, a dealer in exotic animals is required to get a special license from the U.S. Department of Agriculture that is specific to his needs for the animal. For example, a dealer will be required to receive a dealer's license, while a research facility will need to get a research license. Wolfe, Michael. "US Laws on the Import of Capybaras." , https://legalbeagle.com/6136818-laws-import-capybaras.html. Accessed 21 April 2019.